On February 12, 2014, the floor of Kentucky's Skydome disappeared, taking several classic cars with it. 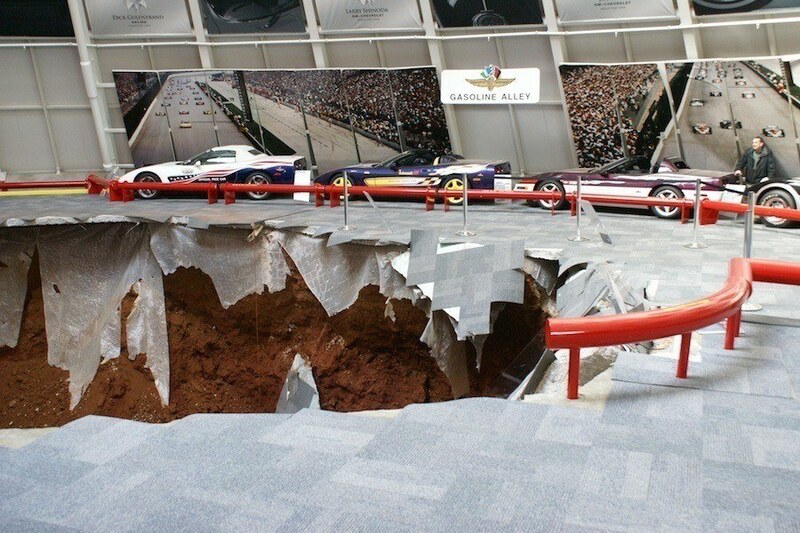 See photos of the infamous Corvette Museum sinkhole. 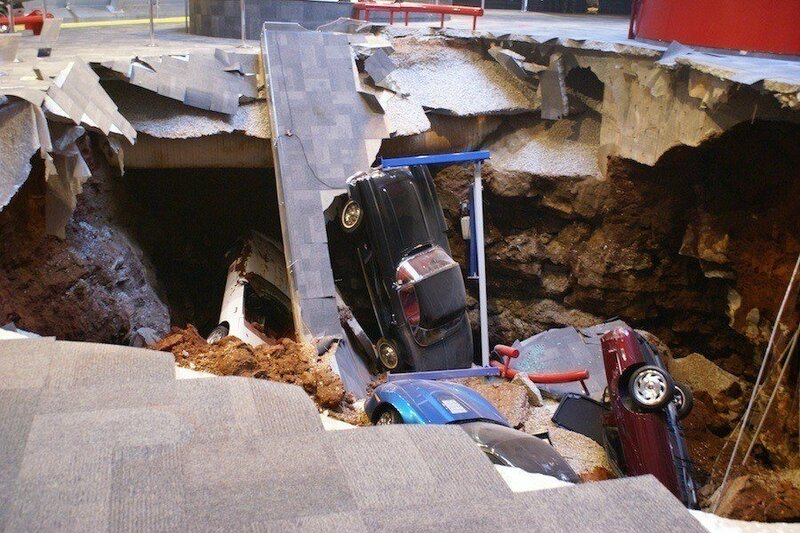 The sinkhole opened up at 5:44 am local time, under the National Corvette Museum in Bowling Green, Kentucky. 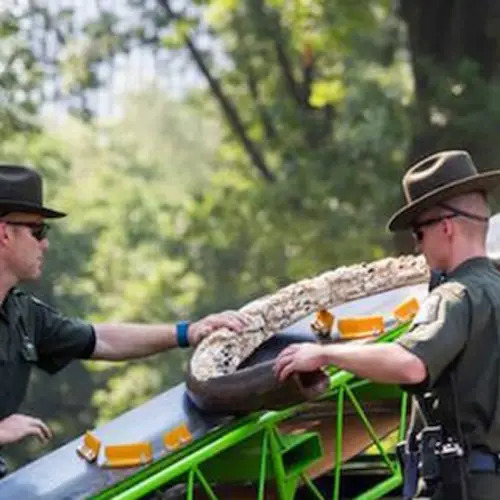 Eight rare and one-of-a-kind Corvettes were plunged into the hole, along with large slabs of concrete, dirt and pieces of display stands and rails. The value of the damaged cars was estimated to be in the region of $1 million. 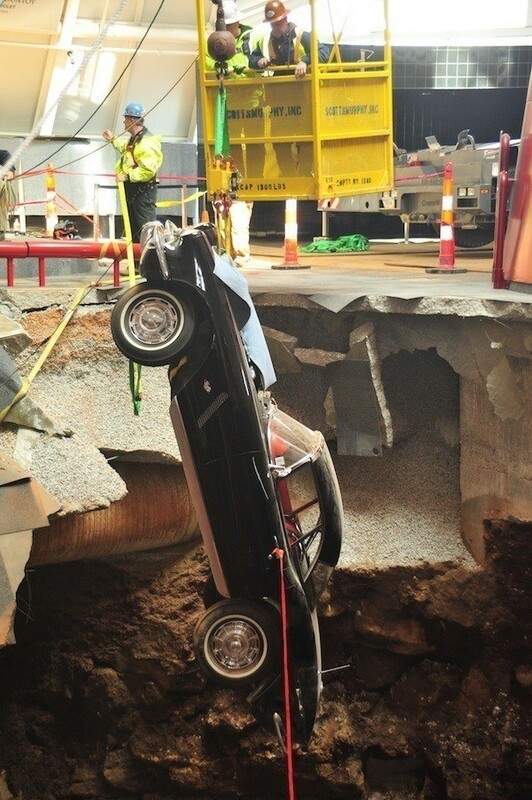 The cars that went into the hole were a 1962 “Black Corvette;” a 1984 PPG pace car; a 2009 ZR1 “Blue Devil;” the 1992 white “one millionth Corvette;” a 1993 ruby red “40th Anniversary Corvette;” a 2001 Mallett Hammer Z06 Corvette; the 2009 white “1.5 Millionth Corvette;” and a 1993 ZR-1 Spyder. 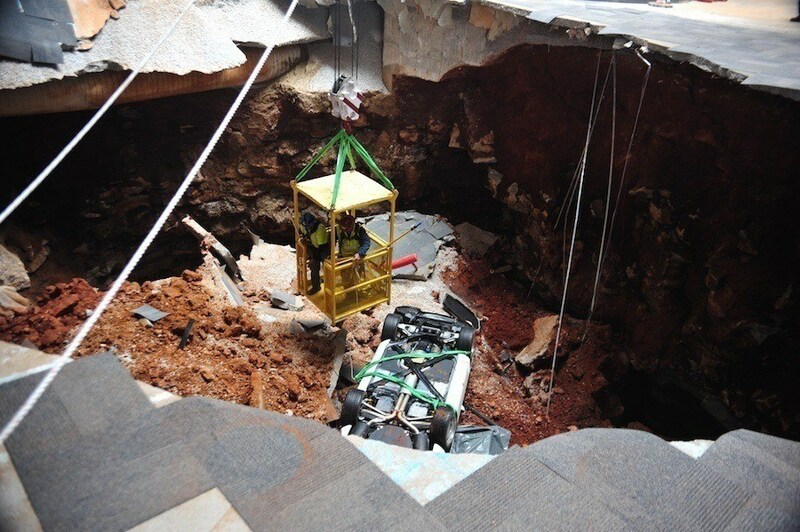 Along with the repairs required by the museum itself, the total cost of the sinkhole was around $5 million. The sinkhole was 60 feet long, 45 feet wide, and 30 feet deep. 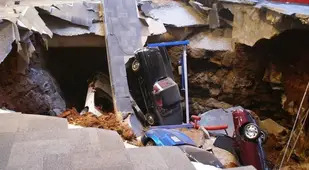 The hole was caused by a feature of Kansas’ “karst topography,” a geological phenomenon in which soluble rocks — in this case, limestone — dissolve, causing pockets to open under the surface. 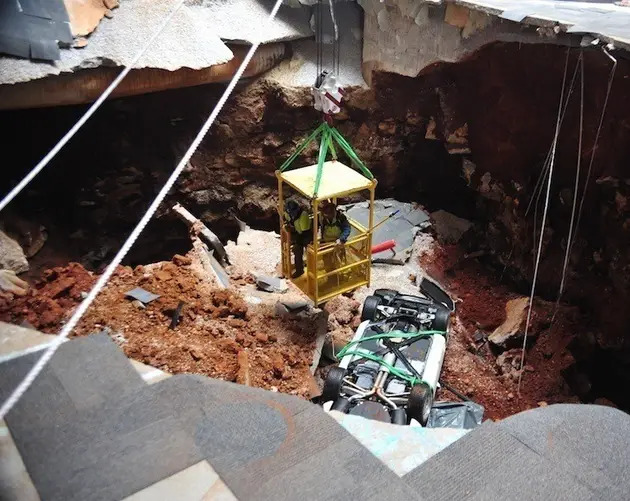 After rigorous testing to ensure another sinkhole was not possible, the repairs commenced, including the insertion of micropiles (steel rods) into the concrete foundations to add more support. The hole was then filled with material that included 4,000 tons of fist-sized chunks of limestone. 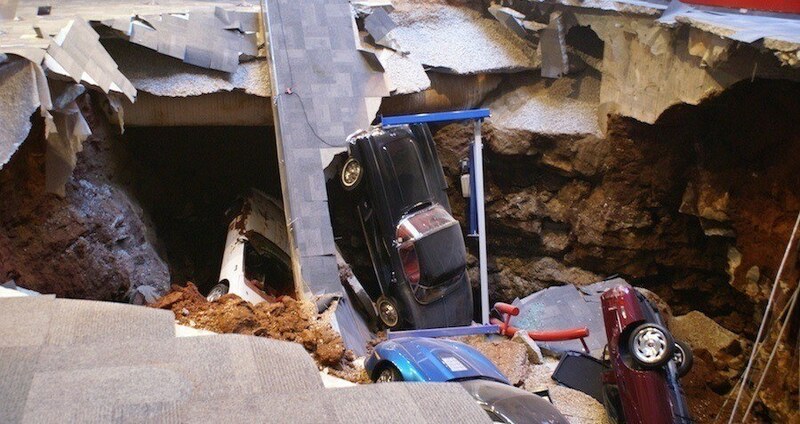 Seven of the eight cars that were recovered from the hole are now back on display. 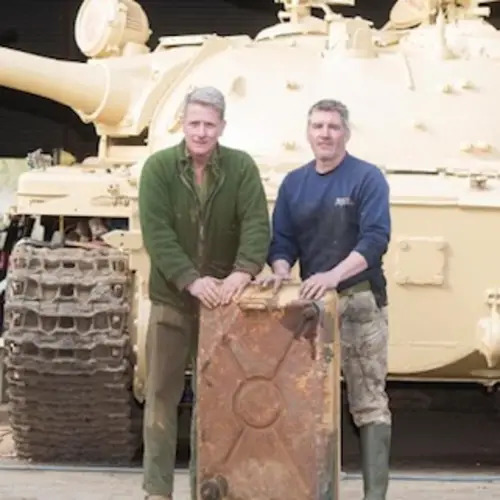 Five of them were too severely damaged to repair. 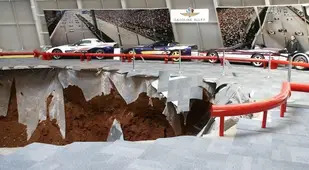 Instead, the battered cars are on show displaying the full brunt of their sinkhole experience, and have become a tourist attraction in their own right. In fact, the museum’s gift shop now sells jars of dirt and rocks from the sinkhole, costing $10 each. 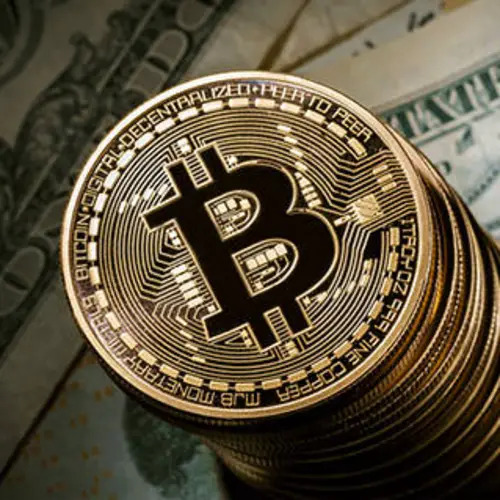 They have sold several thousand so far. The security camera footage showing part of the collapse — which you can watch below — has been viewed nearly 9 million times to date. 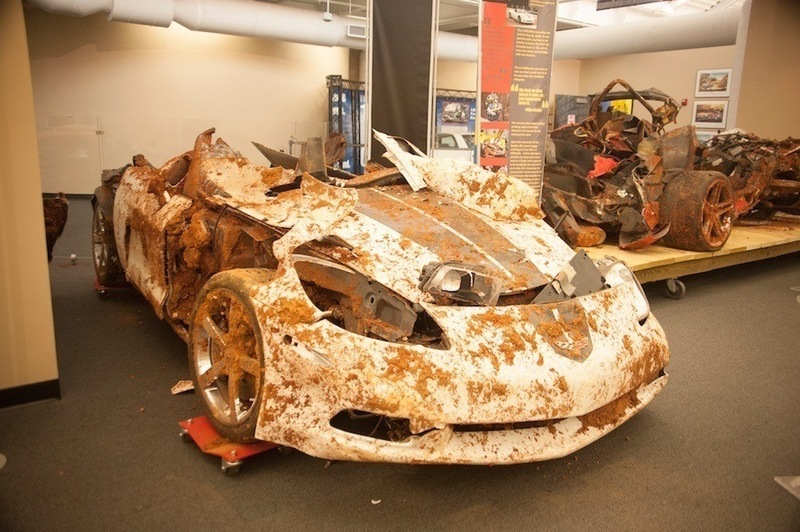 Of the three cars that were repaired, one was the much-loved and extremely valuable 1 millionth Corvette (pictured) — estimated to be worth around $750,000 by itself. 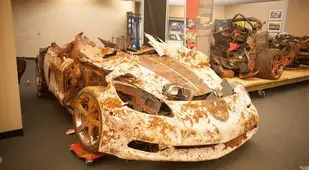 Although much of the car was saved, some sections were too badly damaged to restore and had to be replaced, including the hood and front fascia.